This petition has been created by Emily M. and may not represent the views of the Avaaz community. “The Embassy of India in the Kingdom of Bahrain and Nass Contracting, Bahrain have had discussions with a view to resolving the issue relating to some Indian workers who were absconding from work without notice. These discussions were held in a frank and constructive atmosphere and a mutually satisfactory solution has been arrived at. As a matter of goodwill gesture and with a view to demonstrate their continued concern for the welfare of all of their workers, Nass Contracting confirmed that, notwithstanding the hardship and the financial and non−financial detriment being caused to the company over the years, as a policy the company will not hereafter institute any legal proceedings against run−away workers except in cases of criminal offence, if any, committed by them. In addition, the company confirmed that it will withdraw all court cases pending against run−away workers. The above would enable the affected Indian workers to leave Bahrain at the earliest. The Indian Embassy appreciated the efforts made by the company to resolve the matter amicably." Days ago, I received the devastating news that my younger brother had hung himself in a public garden in Bahrain. He was one of over 100 Indians trapped in Bahrain by their abusive employer -- Nass Corporation. I couldn’t save Pasupathi, but I’ve started this petition to fight for the rights of his friends who are captured and helpless. 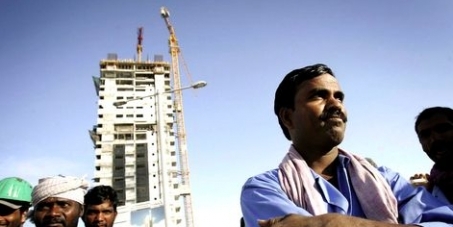 There are over 350,000 Indians living in Bahrain and almost 70% live in slave-like conditions working for wealthy Bahraini companies like Nass who underpay their staff and then get travel bans placed on them so they cannot leave. Living in misery and without hope of escape people like my brother are left with one option: suicide. The Indian Embassy has asked Nass to lift the travel ban on its remaining 100 workers so they can return home, but they’re refusing to listen. To save the lives of men like my brother, I have a plan to hit Nass where it hurts, but it will take the support of people from across India. Nass has entered into a partnership with a Scottish company to bring golf to rich Bahrainis. If we raise the alarm now, we can urge Braemar Golf to pressure Nass on worker’s rights or walk away from this partnership. Nass did not listen a poor labourer's cry for justice, but they will certainly listen to their prestigious business partner. Sign now and when we reach 100,000 Avaaz will deliver it via hard hitting ads in the Scottish media so Braemar gets the message. Sign now and share.